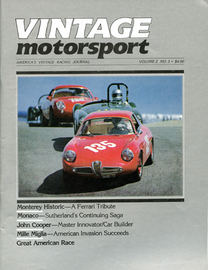 This is the Vol.2, No.3 issue of Vintage Motorsport. The magazine began as little more than a glorified newsletter. Published by the president and founder of the Southeast Vintage Racing Association, Ford Heacock, the first issue of Vintage Motorsport was mailed to SVRA members in May 1982. Four standard-sized sheets of paper were folded in half to make a 16-page booklet that contained several black-and-white photos. On the cover of the first issue, the inscription “Summer ’82” signified a modest quarterly publishing schedule. The fledgling soldiered on in its original format for the next two years, adding pages and a color cover, then some color pages along the way. In early 1984 the magazine graduated to full size, the new format boasting 52 pages and continues to publish top Vintage racing articles to this day.